By Vincent Morgan	| Published on Tuesday, June 23, 2009. Do you know Andre? He’s not the average street artist, let’s discover the character through a little biography. He designs his famous "Mr A" even on our mobile phones. And exhibits at the “Palais de Tokyo” (a famous museum for contemporary and modern art in Paris). Graffiti artist since the age of 13, he is now a millionaire and manager of very chic night clubs in Paris (The Baron, The Paris-Paris, L'Amour Hotel, La Johnsson ... etc). He signs his name with the tip of his paint bomb, an A that means Andre. For ten years, this thirty something elegant man has been painting on the walls of Paris and the world a Shadok with endless legs, named "Mr A". Andre scoffs at the law enforcement and collects trials for vandalism like some other the pictures of his mascot. He tells his feats of arms ("The RATP has claimed 1 million francs from me"), defying the French law, while recognizing that it is the salt of his art: "No graffiti without transgression." 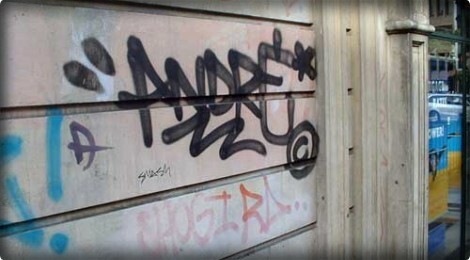 Sweet and charming, also famous for his "Love Graffiti" (first names surrounded by small hearts), Andre is not a wild man, which earned him the scorn of the pure and hard graffitists. But not the one of the arty scene: he exhibited his paintings in the highly visible Louise-Weiss street and has his own space at the Palais de Tokyo, the "BlackBlock", a production company (concerts, parades, performances) and a shop. In showcases-fridges, he sells a selection of Japanese gadgets, bags of his former girlfriend, the stylist Olympia Le Tan, and his Mr A duplicated infinitely on tee-shirts, tote bags, pillows, pins ... The ultimate commercial use of the logo, that became a goldmine: Mr A displays this winter his round face on a limited series of Mitsubishi mobile phones. André denies having sold his soul to the devil. "When I'm painting on a canvas or in the streets, people have the impression that it is more noble. Not me. I customize the 40 phones myself, with my hands; it's not industrial. And it allows me to earn a living while continuing to paint!" From interloper, André's nights have become very fashionable. In Paris, he tags less, preferring virtually virgin lands such as Lisbon or Tokyo. While he always goes to bed at 6 o'clock in the morning, it is because he is a figure of the night life, co-organizer of parties at La Johnson: a collection of pretty girls with a fringe, young actors and musicians in vogue. These days, La Johnson takes its quarters at the Baron, a former call-girls bar nestled in the eighth arrondissement. We have recently seen Sofia Coppola and Björk there. Andre spins discs on occasion, Kate Bush or Daft Punk, interspersed with texts by Boris Vian. On the decks shines his Trilogy ring, from Cartier, a sign of his recent marriage, in Las Vegas, with Chloe. "Madame Andre", as she likes to be called, has just opened a shop in her name, an elegant boudoir of 10 square meters filled with dresses designed by Gilles Dufour (the majority of their prints are signed by André), vintage fashion and ... Mr A in all its forms.